Now with a focus on the U.S. market, these fully laminated wall charts measure 26.5 x 37.5 inches and emphasize the most common fish and shellfish species. These full color wall charts include scientific names of species, common names in many languages, size data, and valuable identification guides. They are printed on heavy, laminated art paper. 27" x 39". Brought to you by the publisher's of the Meat Buyers Guide. New, now LARGER and now Laminated! Measuring 26.5 x 37.5 inches, these full color posters emphasize the most common foodservice cuts of beef, pork, lamb and veal. 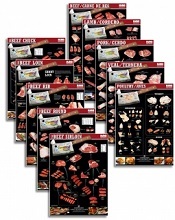 Also available are beef specific charts by primal (Chuck, Loin, Rib, Round and Sirloin). The newest additions to Urner Barry's line of Wall Charts, the egg and poultry posters measure a sizeable 26.5 x 37.5 inches and are fully laminated. Save money with a PACKAGE DEAL! We offer cross-protein combo deals as well as 10-piece seafood and red meat sets from both Urner Barry and NAMI.